Not since the days of chomping down on cheap wings at The King's Head and Malones have I really ventured out into Kits for eats. Yes, those days have long passed and neither can I tackle 4 dozen wings at one sitting. 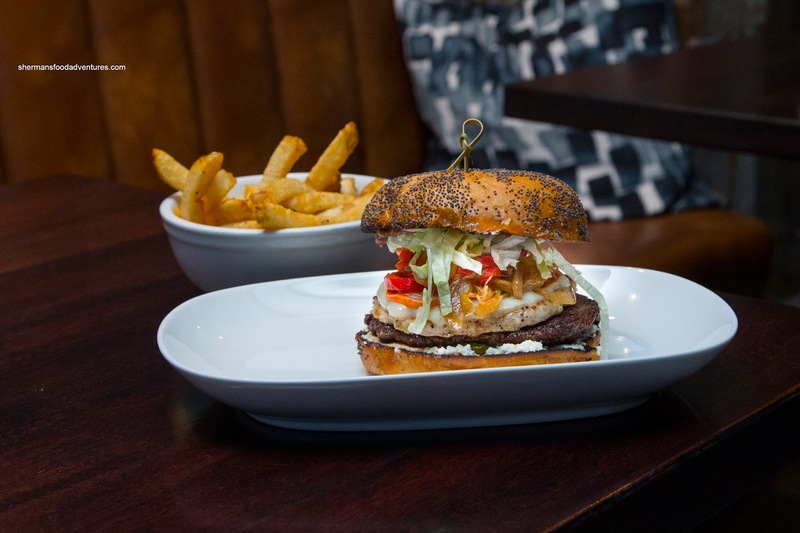 However, the recent Burger Challenge brought me back and to a gastropub no less in The Ellis. 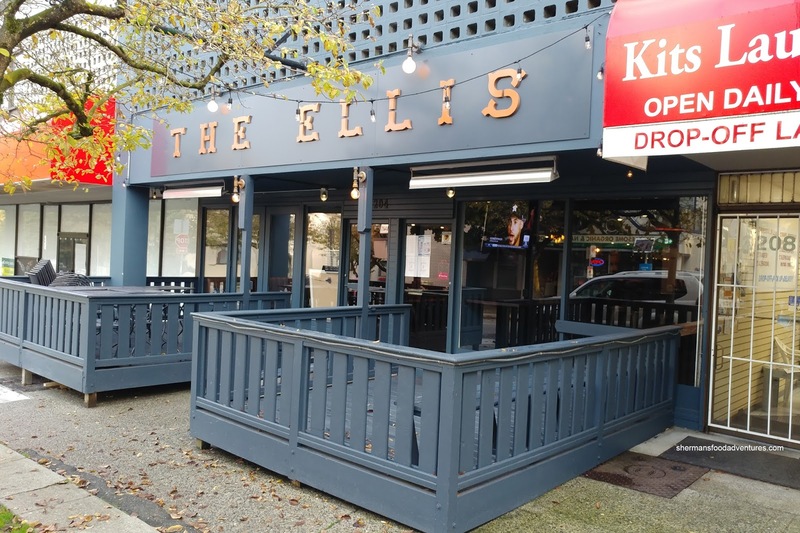 Located on York, The Ellis is not far from the cluster of restaurants along Yew. Spacious, but still pub-like, the interior was not too dark and there was a combination of a long table and smaller ones. We came here for the burger, but we also ordered a bunch of other things including a pub favourite in the Togarashi Wings. Just by the name itself, one would realize that they put an Asian spin on them. 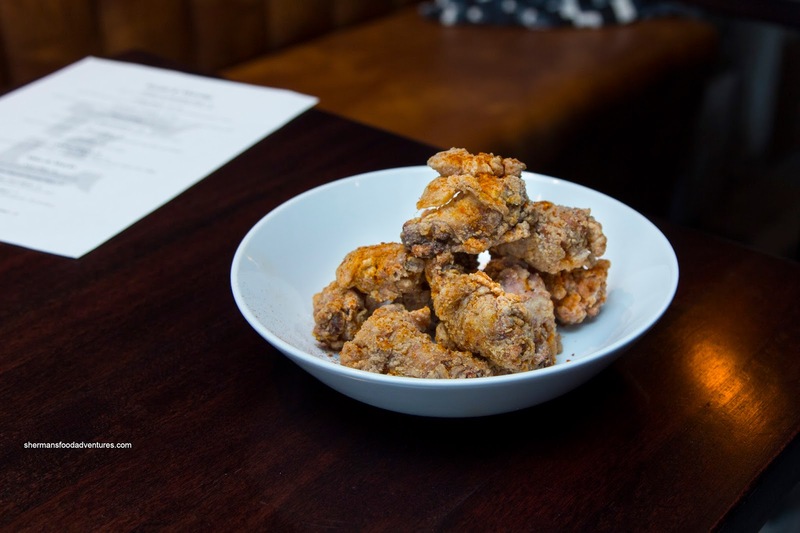 I thought they did a really good job with the deep fry as the wings were crispy with rendered skin. Underneath, the meat was moist and tender while a bit lacking in flavour. However, the ample togarashi helped alleviate that with a spiciness. Next up, we tried the Grilled Octopus with crispy potatoes, chorizo buttermilk sauce, confit onions and Swiss chard. Beautifully plated, the veggies were nicely charred and tasty. 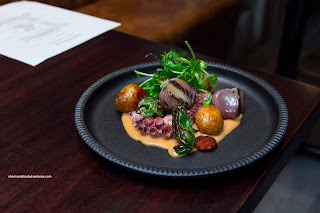 As for the octopus, it was tender, but too tender where it was lacking any resistance or chew. It did taste good with enough seasoning as well as a background tanginess and spice from the sauce. Surprisingly, one of the best small dishes was the Vegetables! 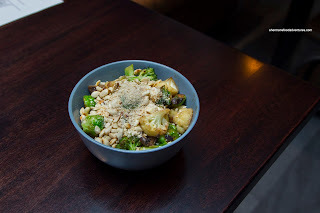 which consisted of Brussels sprouts, cauliflower, broccoli and mushrooms with roasted garlic, chili and lemon. These were on point with a vibrant crunch while still cooked all-the-way-through. Masterful job on the Brussels sprouts as they can be tricky. The saute was definitely subjected to enough heat as there was very little moisture at the bottom while the flavours were intense. 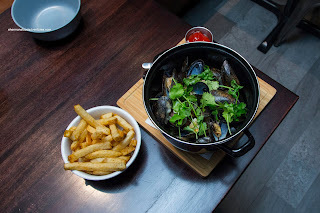 After this we moved onto the Pound O' Mussels in a broth sporting double smoked bacon, Talisman ale, butter & winter herbs. I thought the mussels were fairly well-prepared being buttery and soft. As much as I enjoyed the ample bacon and strong ale flavour, the broth could've been cooked down just a tad more. Of course we eventually had the Burger Challenge entry in the Mediterranean Burger consisting of one pork and one beef patty, roasted peppers and onions, ricotta and provolone cheeses, pickled chillies and dried tomatoes. This was a nice-looking creation which had great mouth-feel mostly due to the soft poppy seed bun. It was still able to hold everything in without disintegrating. The peppers and pickled chilies along with the dried tomatoes added an appealing tang and spice. We actually preferred the beef patty alone without the pork patty as it was a bit dry. However, the combination of ingredients provided enough moisture to help alleviate that. 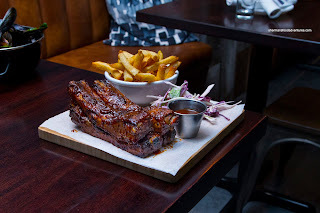 Our last item, the Hickory Smoked Side Ribs, was our absolute favourite. We didn't expect such a great dish from a gastropub. The long whole side rib (not cut in half) was house-smoked, grilled and finished off with a spicy BBQ sauce. The smokiness was strong, yet not overpowering while the rib was meaty and tender. I loved the slight chewiness of the meat where it wasn't too soft. What brought the whole thing together was the awesome BBQ sauce as it had depth and was notably spicy while not overly sweet. The side of fries were money too being house-cut, crispy and potatoey. 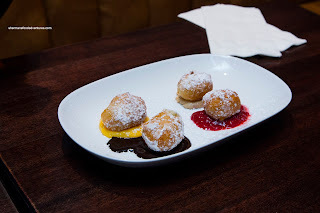 For dessert, we had 4 Mini-Beignets atop lemon curd, chocolate, raspberry and peanut butter. These were more like soft and light egg puffs (similar to the Chinese ones) rather than the chewy and denser New Orleans-style. We liked these more since they were so airy and lightly crispy. The sauces were quite good too. 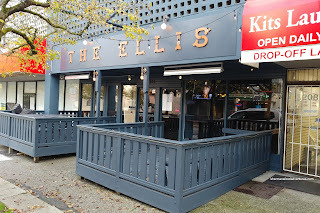 Overall, the Ellis offered up some pretty good eats and really lived up to the gastropub moniker.